My personal Curry Monday challenge has got me pondering as to what exactly the word “curry” means. Wikipedia and google couldn’t come up with a decent definition so in my eyes a curry is a dish with an Asian influence featuring vegetables, meat or fish, highly flavored with various spices, and often eaten with rice or a type of flatbread. When I first started my Curry Mondays a couple of weeks ago Muffin left a comment pointing me towards kale & chickpea curry by Sarah Raven, last week Claire did her own verson of the recipe and tonight it was my turn. Like Claire I was unable to get hold of kale so used spinach instead. I did intend on making some naan bread to go with it, but what with the gorgeous weather the last thing I wanted to do was knead dough. 1) Fry the onion and garlic until softened. Stir in garam masala, chilli, ginger, salt and pepper. 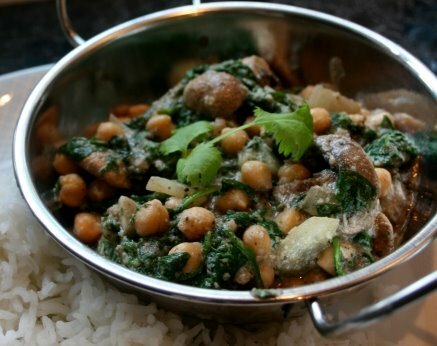 2) Pour in the chickpeas, coconut milk, mushrooms, lemongrass and lime juice. Simmer for 30 min. 3) Stir in spinach, soy sauce and thai fish sauce and simmer for a further 5 min. Serve.